In 1987, Shirish joined the newly established Petroleum Development Laboratory, University of Alaska Fairbanks (UAF) as Research Associate. He was instrumental in designing the research laboratories and overseeing the graduate research. He joined the faculty of the Petroleum Engineering department in 1991 and rose through the ranks to Full Professor in 2007. Shirish served as Director of the Petroleum Development Laboratory for the past 10 years. He then joined CPG in Sep. 2016 as Saudi Aramco Chair Professor of Petroleum Engineering. Shirish has served in numerous capacities the professional Society of Petroleum Engineers (SPE), American Association of Drilling Engineers (AADE) and the Accreditation Board for Engineering and Technology (ABET). Shirish has served as UAF Faculty Senate President and Chair of the University of Alaska system-wide Faculty Alliance, representing all three university campuses, as well as 7 rural satellite campuses. Shirish also serves as Associate Editor of the Arabian Journal of Science and Engineering (AJSE) and serves on the editorial board of Journal of Petroleum and Environmental Biotechnology (JPEB) and International Journal of Petroleum Engineering (IJPE). B.E. degree in Mechanical Engineering from the University of Pune, Pune, India. M.S. in Mechanical Engineering from the University of Pittsburgh, Pittsburgh, PA, USA. Ph.D. in Mineral Resources Engineering from the University of Alaska Fairbanks, Alaska, USA. Shirish has over 30 year’s research experience in the areas of PVT/phase behavior, miscible/immiscible displacement, Methane Hydrates, and GTL transportation studies. He has managed/co-managed several U.S. Department of Energy grants and other projects with international oil companies. He has been PI or Co-PI of over 20 successfully completed projects. His H-Index score is 15 and he has authored or co-authored over 95 technical papers, 1 book chapter, 5 edited proceedings and over 50 conference presentations and technical reports. Andrew Johnson, Shirish Patil and Abhijit Dandekar, “Measurement and modeling of gas-water relative permeability, Mount Elbert gas hydrate well, Alaska North Slope”. 2011. Shirish is a Distinguished Member of the Society of Petroleum Engineers and serves as a Commissioner on the Engineering Accreditation Commission (EAC) of ABET. He received the UAF Distinguished Alumnus award in 2010. 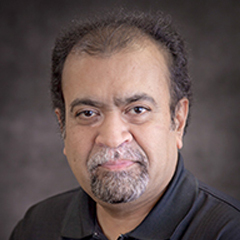 Recipient of the SPE Western North America Service award (2006) and SPE Western North America Distinguished Achievement Award for Petroleum Engineering faculty (2014), Shirish has also received “Outstanding Faculty Award” more than nine times during his 29 year tenure at UAF. Shirish was the recipient of the Alaska Engineer of the Year (2005) award (from all engineering societies). He received UAF’s highest service award, the Emil Usibelli Distinguished Service award in 2007. Shirish was appointed as State of Alaska representative in the US Interstate Oil and Gas Compact Commission by Alaska Governor Frank Murkowski in 2005, which he served for more than 10 years.